LinkToss.dmg 0.2, ~160KB, Universal Binary, tested in Leopard but should work in Tiger. To Install: Open DMG, drag Link Toss.app to your applications, double click on Link Toss.app to choose which browser you want Link Toss to open if you don't have any browsers open yet. 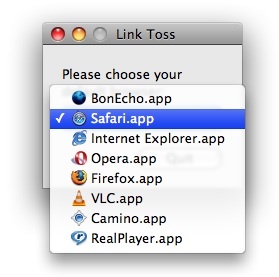 Then go to Safari's preferences and set Link Toss to be your default browser. Enjoy! P.S. Thanks to Josh for the idea! P.P.S. I'm Alex. My website is here.